Description: Level: Assembly Product and process design engineers, lean / reconfigurable robotic cell design engineers, industrial engineers, system integrators and engineering managers, quality control engineers, manufacturing systems engineers, visual factory designers, sensor and vision system engineers, students & faculty, interested in fixtureless assembly and joining, welding and other lean sensory-feedback controlled robotic solutions, methods and technologies. Also excellent for undergraduate / graduate education and research. 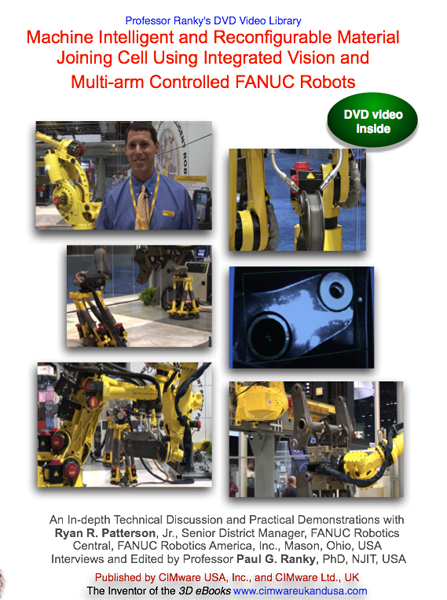 Industrial Sponsors/ Contributors include with special thanks to Ryan R. Patterson, Jr., Senior District Manager, FANUC Robotics Central, FANUC Robotics America, Inc., Mason, Ohio, USA, Catherine M. Powell, Senior Marketing Analyst, and Gary Zywiol, Vice President, Product Development, FANUC Robotics America, Inc., Rochester Hills, Michigan, USA, CIMware Ltd. UK, CIMware USA, Inc., and others. System Requirements: DVD-ROM: NTSC standard definition (SD) DVD video player for TV, or computer. Approximate length 31 minutes, in 16:9 widescreen format, also playable on a 4:3 regular screen, or any good computer screen (800 x 600 resolution, or better). Furthermore available in PAL DVD video, in streamed digital, and Apple Video iPod formats. The HD (high-definition NTSC and PAL) formats are also available as soon as the HD DVD standard is finalized and players are available.